As news of the Supreme Court’s decision on marriage equality spread, many companies and organizations switched their Facebook profile photos to rainbow themed tones — and one Little Rock, Ark. 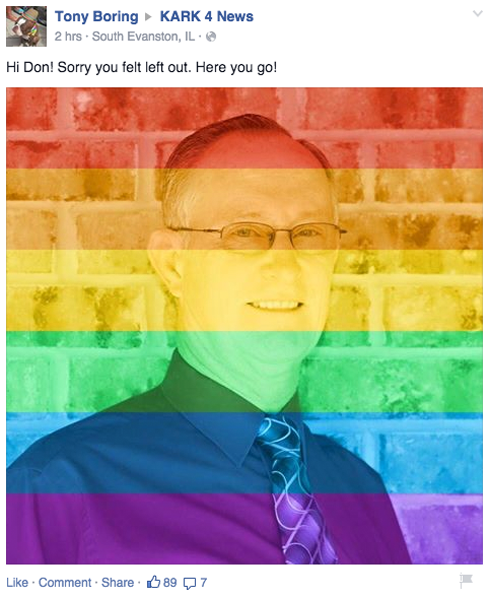 viewer lashed out at his local NBC affiliate for changing its logo to a rainbow themed one. The only problem — it hadn’t. 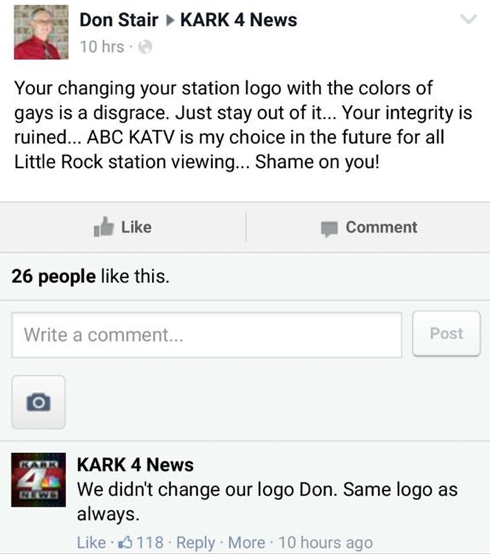 Facebook user Don Stair, who posted his displeasure to the station’s Facebook page, was actually viewing KARK-TV‘s logo that was, as it has for years, includes the NBC peacock. The NBC peacock is one of the most recognized brand symbols in the world — and has always featured multicolored plumes. Originally introduced in 1957 and featuring 11 feathers, the logo was designed to mark the advent of color television broadcasting — and a not-so-subtle hint at the network being “proud as a peacock” for being the first with this technology. The logo was used until 1976, when the network switched to a trapezoid themed logo. But the peacock made its return in 1979 in a simplified form and placed over the trapezoid shape. In 1986, Chermayeff & Geismar redesigned the logo again, making it even simpler (and abstract) — taking on its present form. Since then, NBC has applied a variety of effects, such as a sheen or “gel” to the logo at different times, but the basic shape and colors have remained the same.